Whether it’s a fancy dress party, just a casual day out, or it’s Christmas morning and you’re feeling particularly adorable. 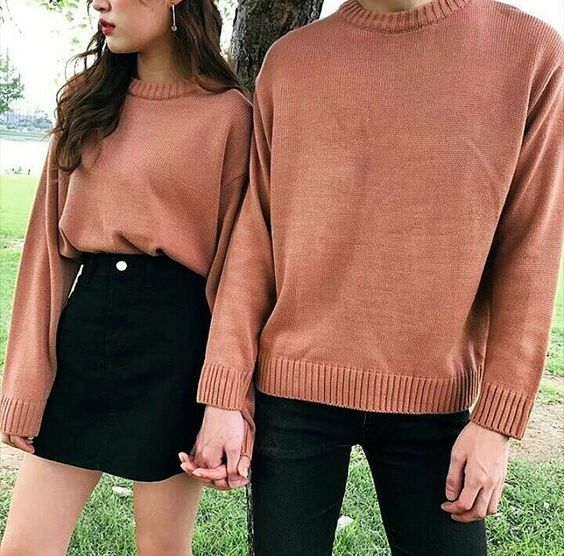 Matching your outfit with your significant other can be super fun, not to mention a great opportunity for a cute photo! Whatever the reason or occasion for matching your outfits, we have compiled a selection of 30 ideas to get yours and your loved one’s outfit’s perfectly in sync! Perfect outfits to travel in for a weekend away. These light fabrics are great for warmer weather and the inclusion of a ladies straw hat ensures they’re not too “match matchy”. 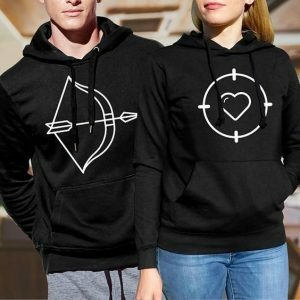 This is a very sweet and simple way to wear matching outfits and show your love for one another. It also makes a great gift for your loved one on a birthday or anniversary! 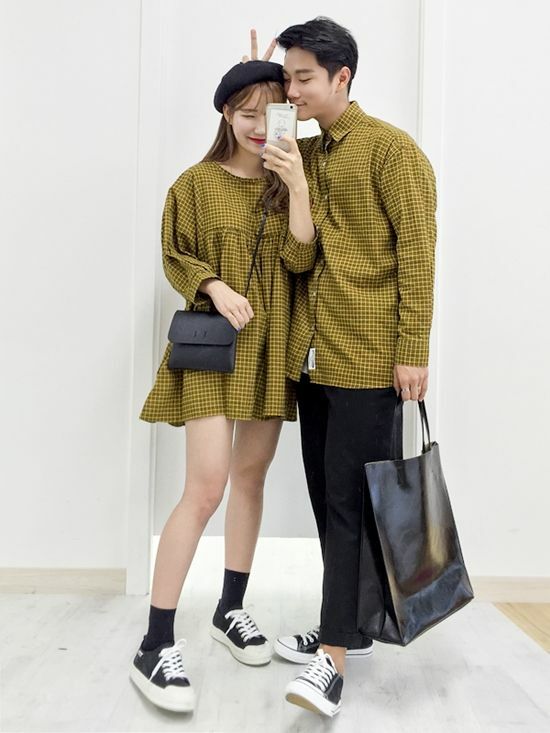 Okay, so it’s not technically a whole outfit but if the matching ensemble trend isn’t for you and your significant other, this is an adorable way to match up…just a little bit. Rather than wearing completely identical outfits, wear the same colours just on differing pieces on each of your outfits. You’ll still match but have your own identities too. If there’s ever a time to go all out matching and be unashamedly cute, it’s at home, preferably on Christmas morning in these snuggly tartan pyjamas. Keep it nice and simple with a black t-shirt and blue jeans. You can also match your shoes for this look but wearing different colours works too as the base of your outfit is still identical. Perfect for couples who like a little edginess in their look, black jeans and leather biker jackets are a winning combo. Layer with t-shirts or hoodies and you’re all set. Once again you can alter your shoe choice to suit your individual styles, just like the example here. Ladies may wish to opt for studded boots and gents for sneakers, or visa versa! 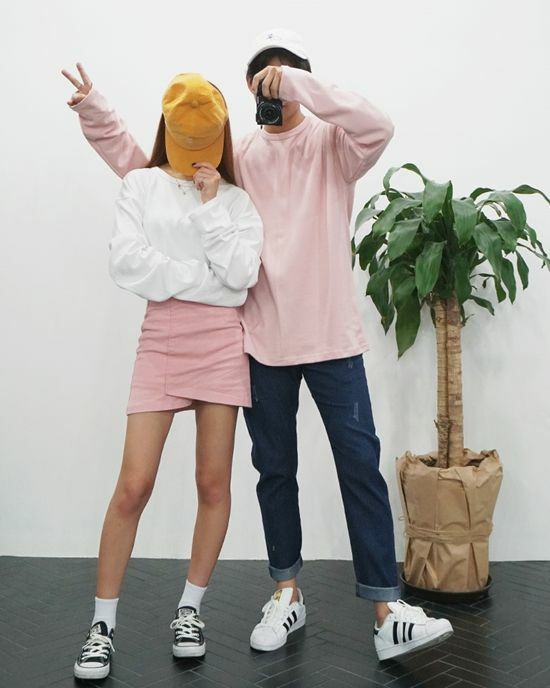 Any way you choose to style it, this is an effortlessly cool couples look. For a laid back look that’s perfect for a weekend stroll, try checked shirts and ripped jeans. It’s a simple look that appears effortless yet stylish, it’s also super comfortable. An added bonus when you’re enjoying some down time with your partner at the end of a long work week. 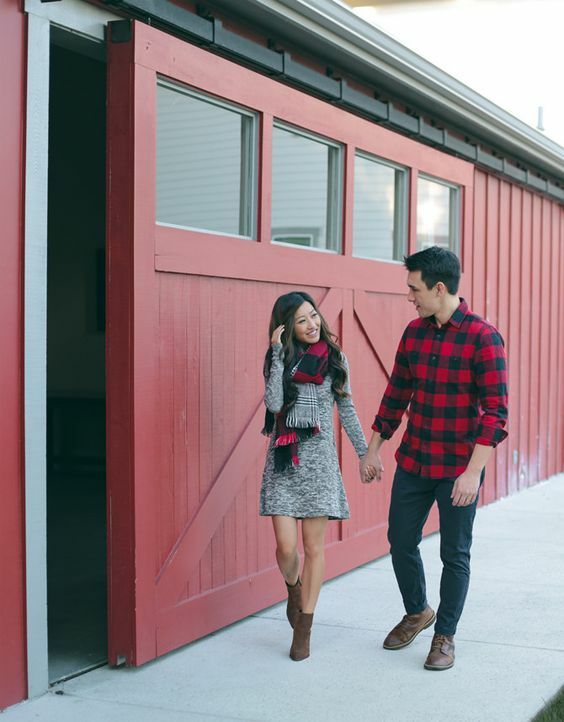 This is a super smart and stylish way to dress with your other half. No fussy colours or patterns, keeping it simple and sleek with a suit like this is perfect for any formal event, even a wedding! Matching your dress to your partners shirt is an adorable way to coordinate your outfits! Pop on some matching sneakers to finish off this lovely casual look. Great for a casual afternoon stroll or a trip to the grocery store! 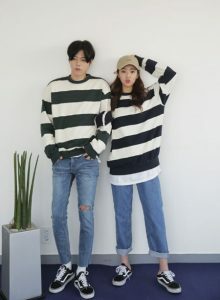 If you can’t, or don’t want to wear completely identical outfits, try picking a pattern or colour from your partners outfit and incorporating it in to yours. Like the example here, a scarf that matches a shirt is a great way to do this. Notice the cute matching ankle boots too! Is your partner also your workout buddy? 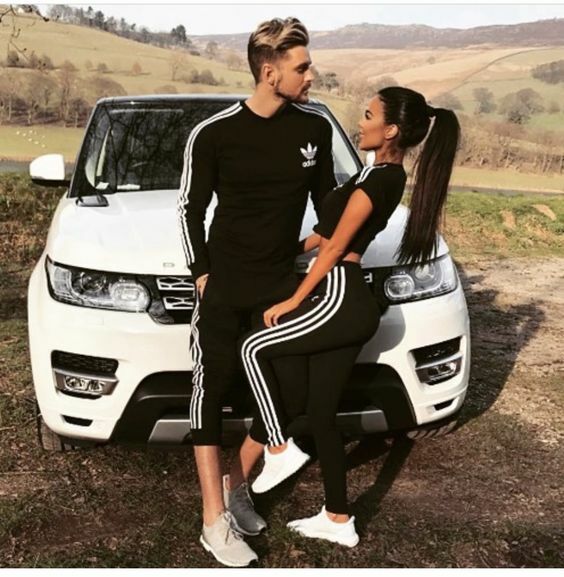 Why not sweat in style in matching gym clothes! You can choose any sportswear you like, with on trend racer stripes like this, you’ll look like the perfect team! Wear in the gym, at the park or just out for a jog or brisk walk. When the weather is a little chillier, match yours and your loved ones jumpers for a super cute, cosy couples look. You can choose whatever you would like to wear on your bottom half but matching the colours for these too does look extra sweet. As it’s rather a bold pattern, so wearing stripes together can be a particularly striking look. If you want to avoid looking like you’ve just arrived home from a prison outbreak, try wearing stripes in slightly varying colours. No need to keep the fun of couples matching just to your outfits. Why not match up your outer wear with some super stylish coats. This is a great way to perfect this trend for autumn and winter. 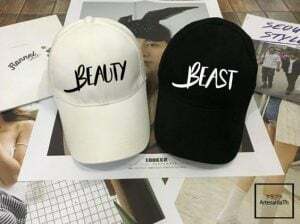 No need to stop there either, you can also choose matching accessories such as hats, scarves and gloves to make an entire matching ensemble. Do you and your partner have a special occasion coming up for which you’ll need to wear formal attire? Why not choose a dress in a colour that matches your partner’s jacket? Matching up the colour palette of your ensembles without wearing pieces that are exactly identical is an ultra stylish way to wear this trend. 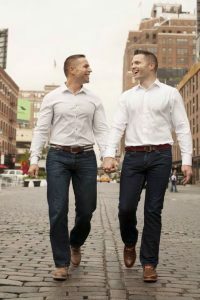 Matching your partners tie to your chosen dress colour is also an excellent way to rock this look in a more subtle way. 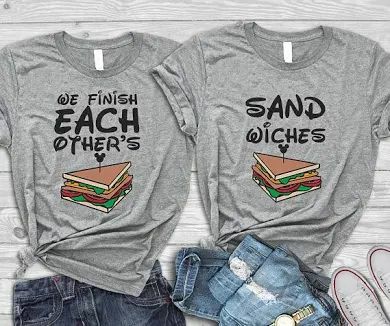 For lovers of a certain icy Disney classic, these t-shirts have an adorable quote from the movie that’s perfect for couples. These would also make a great birthday or Christmas gift for your other half. 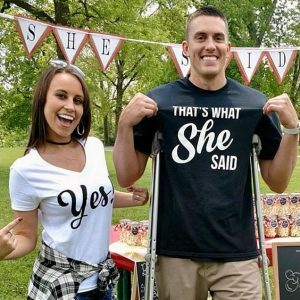 These T-shirts are a truly memorable way to mark your engagement and make for wonderful photographs to share with your family and friends! Wear them for your engagement party or take photographs of you wearing them in secret to send out announcing your upcoming nuptials! Matching bathing suits make for the perfect vacation photograph and are a lovely way to show your connection on a trip away. 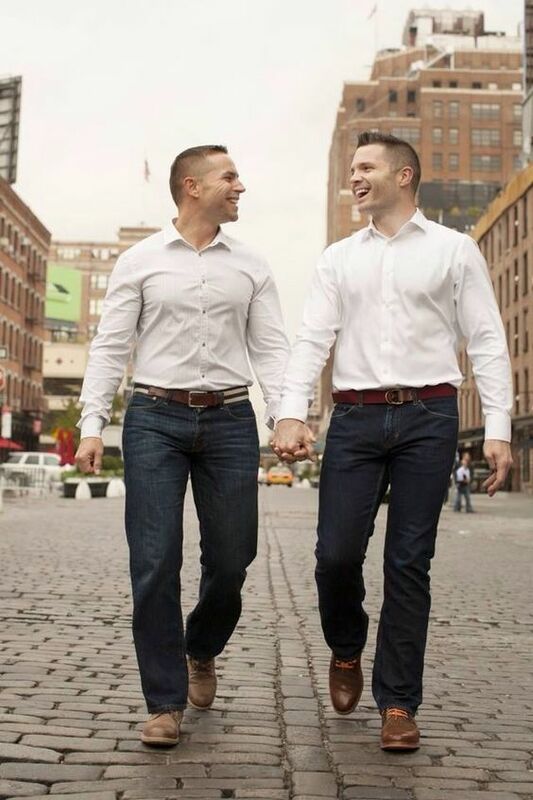 This is a great choice for honeymoon photographs to send to your family back home. Choose a print or colour that suits you both so you’ll feel perfectly happy and confident on the beach and by the pool. Decide together on an accent colour to incorporate in to your outfits to take your matching a step further. 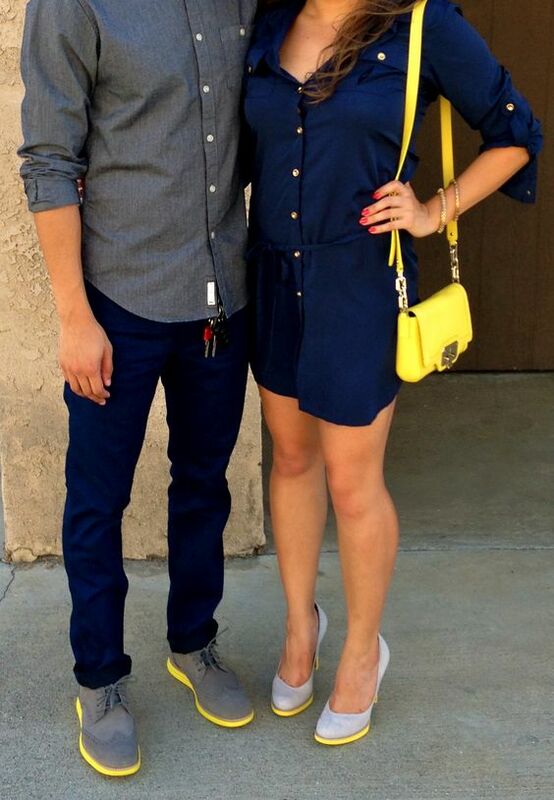 A bright colour like the luminous yellow chosen by this couple is a great choice! It’s bright enough that it’s noticeable and makes a statement but they have used it minimally to keep the look stylish. The ideal matching outfits for Harry Potter fans! 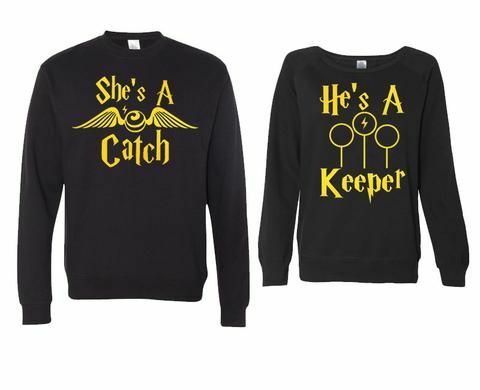 Get your hands on these magical jumpers that demonstrate your love for each other using super cute references from the books themselves. You know what they say, couples that play together, stay together! Here’s an outfit you just cannot go wrong with! Blue jeans with a clean, crisp white shirt is the ultimate smart/casual look. Matching with your loved one is easy to do with this classic ensemble as it incorporates simple pieces and is easy to wear with a million different shoe choices. 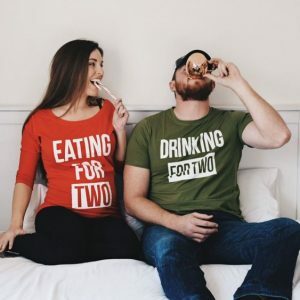 Getting snuggled up with your partner is just about one of the nicest feelings in the world, make that experience even more adorable in fashionable matching lounge wear. Here is great way of adding your little ones to the equation. Match your Christmas PJ’s with your special little reindeer to give this trend an extra special, festive twist. Perfect for babies first Christmas Eve and Christmas morning. 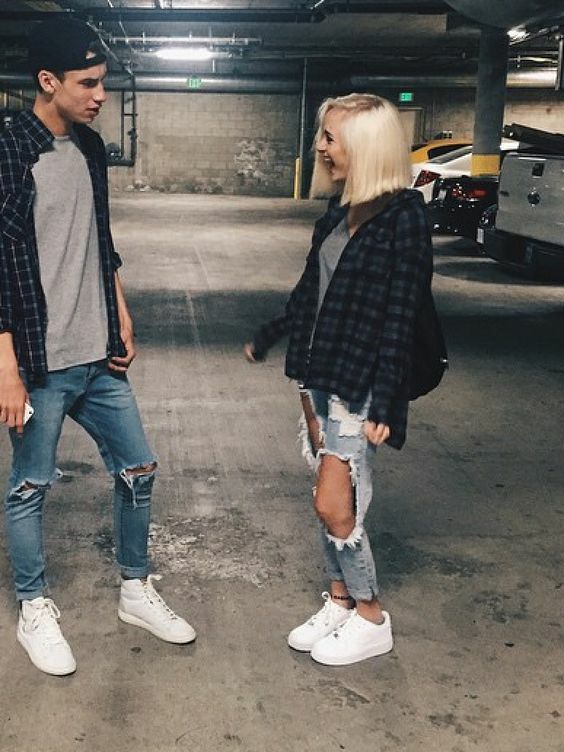 Snaps of your family in these matching outfits would also make an ideal holiday card. Whether you’re wearing a bikini top, t-shirt or no shirt at all, everybody needs shorts for summer. Choose the style you would each like and grab yourself and your partner some summer shorts in a matching fabric for a sizzling couples beach look. Hoodies that come in a set like this are a great look for couples as they only really work together as a pair. 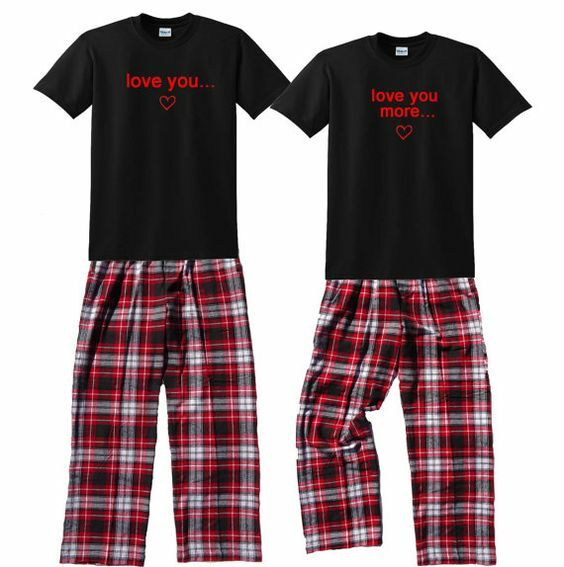 If you really love being right by your partners side, this is the perfect look for you! Do you have an extra special announcement to make?! Try these super fun slogan t-shirts especially made for expectant couples to share their news. Take photographs of yourselves wearing them to send out to your friends and family or simply wear the shirts in their company and see how long it takes them to notice your special message! 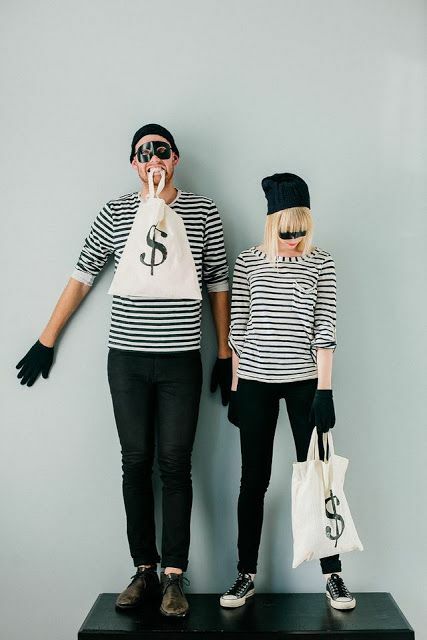 There are thousands of couples costumes out there but here is a nice simple one that allows you and your partner (in crime) to look like a pair of super smooth criminals. All you’ll need is a striped t-shirt and black jeans with a simple black mask and a swag bag to re-create this party look. Your outfits don’t need to be identical to match. Try selecting a fabric such as denim or wool and incorporating this in to both of your outfits with another colour you both agree on. You’ll match up perfectly but don’t have to wear the exact same outfit! 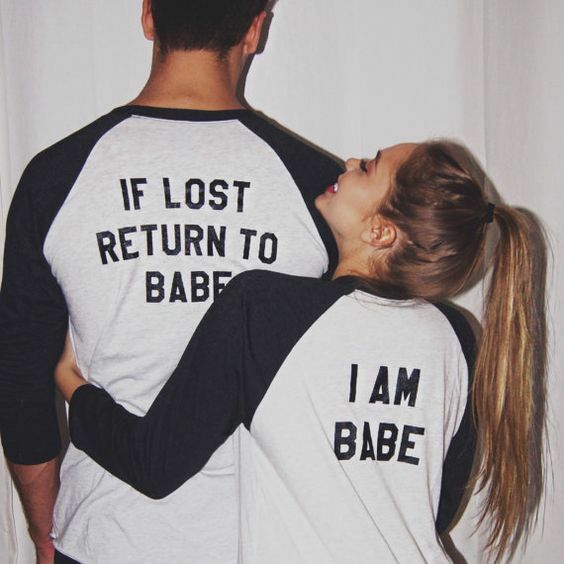 If you really can’t stand to be away from your partner, you’ll want to think about purchasing yourselves a twinsie. Like a onesie, except this outfit will have you joined at the hip – literally! 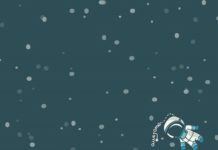 Great for the cold winter months when nothing but staying on the sofa and cuddling will do.